Lost Trail creates 5 cinematic soundscapes in 5 minutes. Count this one under this year's best records! Don't miss it! 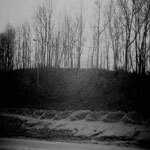 US band LOST TRAIL have been around since 2010, and is a highly active recording unit closing in fast on 100 releases since they started, and is also a fairly active live project from what I understand. “Lost Entropy” was released in the fall of 2014 as the band’s contribution to Silber Records ongoing series of EPs adhering to the 5 songs in 5 minutes concept: A mini EP clocking in at 5 minutes playtime with 5 songs. The 5 creations on this EP are all ones concentrating on creating an atmosphere rather than to create minimalist songs in a more conventional manner. Their specialty appears to be to use plucked guitar or piano details, sometimes both, and apply them to an arrangement with a noise-oriented drone as a key or dominant element. The brief length of the songs here makes it difficult to create something truly engaging using these elements on the short time at hand here, but when they manage to pull it off, as they do in the concluding song For PSH, the end result is mesmerizing, in an American Gothic kind of manner. The odd one out on this EP, and arguably the most thrilling of the 5 short songs, is called John Carpenter. Hammering, tension inducing keyboards are used to good effect here to craft a horror movie feeling of high dramatic. If drones, noisescapes and atmospheric laden creations is to your interest, the mere 5 minutes needed to listen through this EP should prove to be interesting. In particular if you enjoy atmospheres with a subtle, menacing atmosphere, of the kind you may well encounter in well made horror movies. Lost Trail’s “Rural Entropy EP” is a haunting mix. Elements of it hover about and remain ingrained in the mind long after the pieces have ended. Track lengths help to better emphasize their fleeting nature. Within their short lengths they hint at far larger pieces hidden right outside the sound’s periphery. Ghostly in nature the pieces explore quite a bit within their time. “Blood Forcefield” opens the collection up with a swell of sound. This lingers as outside noises try to burst into the song’s brief length. For “Emerald Valley Flameship” the piece veers to and fro, refusing to remain still. Elements of piano filter their way into the dusty track. Piano serves as the focal point for the cryptic “For PSH”. Easily the collection’s highlight “For PSH” employs a gravelly almost David Lynch like industrial debris to fill the empty spaces in the sound. Playing around with listener expectations the song goes forward and backward whenever it chooses. On “John Carpenter” the music is incredibly tense and uneasy. Beneath the endless repetition there are wobbles within the sound. Ending things off on a sweet note is the calm “The Brown Mountain Lights” whose gentle tones contrast greatly with what preceded it. Little pings of sound dissipate in the heavy air. “Rural Entropy EP” explores the underbelly of sound, letting the crackles and hiss integrate themselves into the pieces. The results are elements normally edited out of the compositions become the focal point and reveal their many charms. A short experimental-ambient soundscape release. I mean it is brief, like five minutes, but it is priced accordingly as it goes for only a scant $1.25. It is a fine sample that could be a sign of a fine full-length to come. Additionally, I thought this might be something wholly new to the Grab Bag, but turns out I have posted the label that released this, two years ago, so thanks for coming back Silber Records, and sorry I posted stuff you worked on without mentioning you, but I am sloppy and very sleepy most of the time.